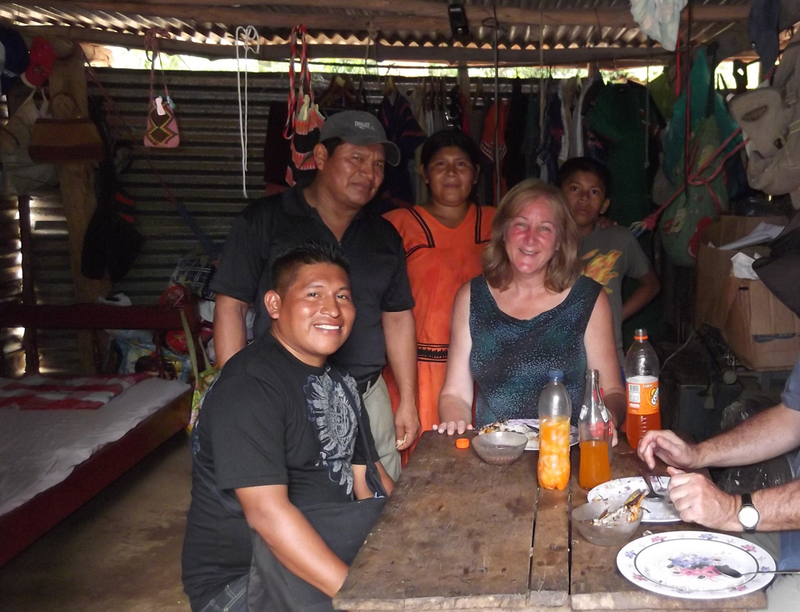 I was very lucky the day I met Susan, a Peace Corps volunteer who is working in a tiny indigenous Panamanian village. I wasn’t able to visit Susan’s village as she was away for a break, but I was able to visit the fabulous Juan Carlos and his friend Elmon in their own village, Soloy. I plan to write more about this visit and the opportunities for others to visit and learn about indigenous Panamanian, but here are a few photos for now. This is a view of Soloy. The river below can provide you with a nice day of rafting or other boating with your host, Juan Carlos. The intersection where you get the bus to Soloy, Panama. As I wait for the bus to Soloy. Life at the main intersection in Soloy. There is one restaurant (of sorts) in Soloy, but it was closed, so Elmon’s family invited me and my companion to dine with them. Dining with Elmon’s family. The other hands belong to to the guy who came there with me. Elmon’s family served my meal of chicken, rice and fresh bean on flat plates on this day, but coffee was served in this interesting cup, set on an interesting stand. Elmon’s uncle then showed me the fruit from which he made the cup. My friend Elmon’s family sews traditional garments for the people of the area. There is no electricity. These are foot powered sewing machines. It takes a week to make one dress. That’s 1/3 the time it used to take to make one by hand. Here’s the fabulous Juan Carlos showing me the fruit that becomes their dishes, cups, and bowls. An interesting bridge. The other people here: two volunteers and behind me is the guy that came with me.